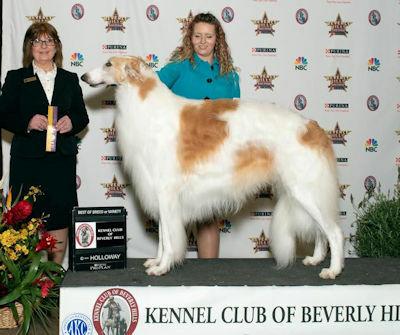 January 13, 2019, Pilot won Best of Breed at the Tacoma kennel club show, the same day his litter sister, Morozova Rey's California Poppy,finished her championship. She pictred below with breeder-owner-handler Janet Adams. March 23, 2019, Pilot finishes his Bronze Grand Championship. Pictured at the top of the page with handler Robin Stachon. Pilot started 2018 with an Award of Merit at the Inland Empire Hound Club of Southern California specialty January 5, 2018. 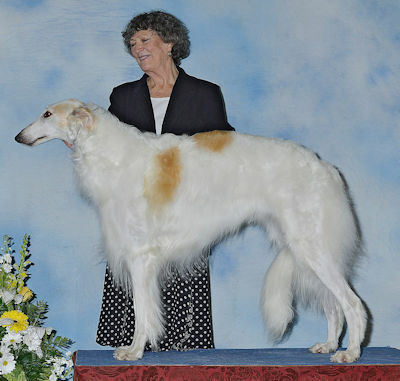 July 5, at the Borzoi Club of California independent specialty, Pilot won Select Dog owner handled. This finished his Grand Championship. The next day he won Best of Breed owner handled, at the BCOC designated specialty with the Channel City kennel club. Pilot was only shown a few more times during 2018, but had several BOB wins and group placements to end up #20 all-breed with 209 dogs defeated. 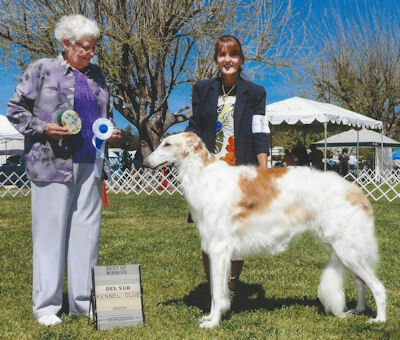 Pilot's new owner, Cynthia Jabour, handled Pilot to Winners Dog, twice, at Borzoi Club of California TSEs, and finished his championship at 1 year of age with his third major at the March 2017 Borzoi Club of California Specialty. Pilot was shown in the classes a total of 7 times. Pilot was one of 5 puppies in his litter whelped in Nevada at kennel Rey (Kay Novotny). As a young puppy, he moved to Aruzia to grow up and be trained as a show dog. Pictured above with Lorrie Scott, owner of Pilot's sire. Pilot is pictured below at 6 months of age. Home This page was last updated February 27, 2019 Â© 2019 Lorrie Scott. All Rights Reserved.